If you are living with fibromyalgia, you're likely familiar with some of the frustrations. Not only do you ache all over for no apparent reason, but it seems like nobody knows why this happens. And until we really know the cause of symptoms, it's hard to find effective treatments. That said, a 2013 study may point to a major cause of the widespread pain and other symptoms which characterize fibromyalgia. Fibromyalgia is a condition which results in widespread pain and affects roughly 6 million people in the United States. At the current time, doctors must result in the signs and symptoms found from a history and physical exam alone to make the diagnosis. This condition is often misunderstood, and the frustration of living with a condition for which there is not a definitive diagnostic test leaves many people with fibromyalgia feeling alone and questioned by those who don't understand. Research looking into the possible causes of fibromyalgia has also been frustrating, and without a known cause, a diagnostic test or treatments designed to modify the cause is lacking. Having considered possibilities ranging from substance P to hormones, researchers have been perplexed about the precise mechanisms behind fibromyalgia symptoms. But now they are saying that people with fibromyalgia may have a lot of extrasensory nerves to a particular part of the circulatory system. These "extra nerves" could cause severe pain and tenderness, dysregulate blood flow, and make it hard for the body to regulate its internal temperature. Here's a quick anatomy lesson to help you understand this finding. In your circulatory system, you have several types of blood vessels. Blood leaves the left side of the heart in large arteries. These branch down into smaller arteries and then arterioles. The arterioles get smaller and smaller, just as tree branches get smaller and smaller, and end in capillaries, the smallest of blood vessels through which the exchange of oxygen and nutrients take place. Upon exiting the capillaries, blood travels through venules, on to bigger and bigger veins, eventually returning to the right side of the heart. The two types of blood vessels we are looking at in this theory are the arterioles and venules. Sometimes, based on changes in the required blood flow into a particular region of the body, blood bypasses the capillaries and travels directly from the arterioles to the venules. Think of plumbing for a moment. Arterioles and venules are different sizes of pipes, and they need valves to connect them. Those valves are called arteriole-venule shunts (AVS). In this study, scientists discovered that participants with fibromyalgia had a bunch of extra nerves running to the AVS. More nerves mean more sensory input, and consequently an extreme reaction to sensations such as pain and heat. So, there are extra nerves which respond excessively to pain and heat, and these nerves control arteriole-venule shunts, but what does this mean? When researching a condition such as fibromyalgia we may find structural changes in the body, but how does that change function. And how could that change in function cause the symptoms we experience? Extra Nerves Mean Extra "Internal Thermostats"
In this study, researchers looked at the nerves and blood vessels in the hand. 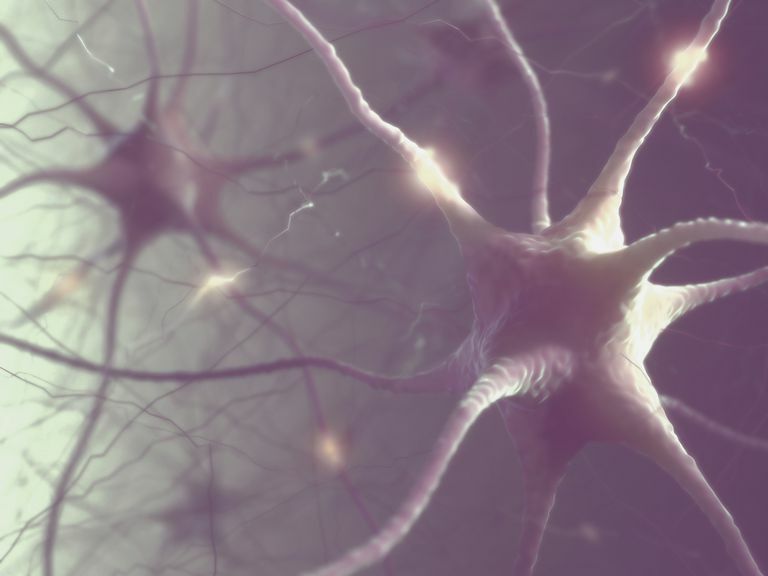 We still don't know if these extra nerves are all over our bodies, but if they are, it may help to explain why people with fibromyalgia hurt everywhere. It could also explain why our internal thermostats are all over the place. In addition to the thermostat issues, are the blood-flow issues. Blood carries oxygen and nutrients to the muscles, but if the body has trouble re-directing blood flow in response to exertion, the muscles become deprived, and therefore weak. Lactic acid builds up and causes that burning sensation with which you are probably too familiar. Additionally, have you experienced that painful pins-and-needles sensation you get when a foot or hand falls asleep? It's caused by inadequate blood flow to a region of the body (called ischemia), and some doctors have long believed that ischemia is responsible for some fibromyalgia pain. Fibromyalgia is currently a clinical diagnosis, meaning that there is not a blood test or radiological study that can be done to confirm or exclude the diagnosis. Instead, fibromyalgia is often a diagnosis of exclusion based on a careful history, physical exam, and ruling out conditions for which we do have diagnostic tests. The researchers in this study believe that—since this finding is a clear pathology—this finding could lead to diagnostic tests. In addition, since an abnormality has been noted, looking at ways to modify that abnormality might lead to future treatment options. All that seems promising, but then so do a lot of other studies. Time will tell. Here's something to keep in mind about this study: It was funded by two companies that produce the fibromyalgia medications Cymbalta (duloxetine) and Savella (milnacipran.) A press release on the findings mentions that the excess nerves could be why those two drugs work; they might help modulate the extrasensory nerves. This finding does raise some skepticism about new therapies as drug companies aren't usually in the habit of pursuing new drugs when they can boost sales of the ones already on the market. Also, this was a small study with just 24 women. We need a lot more research before we can say, without a doubt, that this is what's going on in our bodies. This is an interesting theory that deserves ongoing study, but will hopefully be pursued by other researchers to reduce concerns about bias. For people who live with the frustration of a condition which is not only painful but doesn't have a conclusive diagnostic test, this theory could perhaps reduce some of the stigma and isolation that are hallmarks of living with a chronic misunderstood disease. Albrecht, P., Hou, Q., Argoff, C., Storey, J., Wymer, J., and F. Rice. Excessive Peptidergic Sensory Innervation of Cutaneous Arteriole-Venule Shunts (AVS) in the Palmar Glabrous Skin of Fibromyalgia Patients: Implications for Widespread Deep Tissue Pain and Fatigue. Pain Medicine. 2013. 14(6):895-915. Albrecht, P., and F. Rice. Fibromyalgia Syndrome Pathology and Environmental Influences on Afflictions With Medically Unexplained Symptoms. Reviews on Environmental Health. 2016. 31(2):281-94. Sluka, K., and D. Clauw. Neurobiology of Fibromyalgia and Chronic Widespread Pain. Neuroscience. 2016. 338:114-129.